TWO AWESOME STORIES IN ONE COSMIC BOOK! This is it: the galaxy's most powerful squad and most beloved duo face their fiery finales! 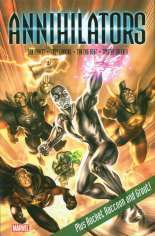 First, the Annihilators must prove they are the ace team of universal protectors that Star-Lord dreamed they could be...or perish in the attempt! 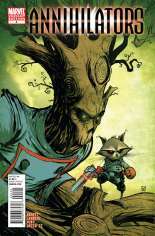 Meanwhile, Rocket Raccoon and Groot face the horrible, reality-twisting menace - who has a key connection to Rocket's secret past - that lurks in the heart of the Half-World Asylum! Want to show the House of Ideas that you want more Marvel Cosmic? Spread the word and buy this issue! 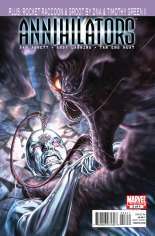 Published August, 2011 (Modern Age) by Marvel Comics and went on sale June 08, 2011 for $4.99 USD. 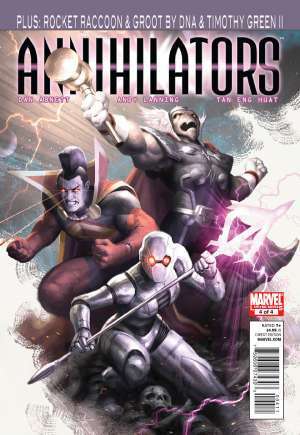 This issue contains 40 pages in Color, the current NM value is $5.00 USD. The publisher has rated this issue T+ (9+).